The next best thing to discovering hitherto unknown works of art by someone you intensely admire is unearthing material about them you never knew existed. Thus it is that Carole Le Berre's substantial volume Francois Truffaut At Work starts from an already winning position. (Admittedly, this is helped by Truffaut himself, who, as Le Berre remarks 'had loved, indeed relished, preserving everything', p.9). It is on the one hand the sheer variety of material that Truffaut kept that makes Le Berre's book such an interesting addition to the director's canon. On the other, the way the author uses the material is also worthy of note, as she blends very disparate elements together to create a continually interesting patchwork quilt of the process of creation- what was excluded in Truffaut's films becomes as fascinating a topic as what was included. Throughout Francois Truffaut At Work , Le Berre's policy is an ardently sensible one as she follows Truffaut's career in chronological order, using his primary source material to highlight issues in casting, script changes and events that took place during filming. It is this approach that enables an extra layer of knowledge to be gleaned regarding a film one thought one knew well- the multiplicity of titles for what eventually became Les Quatre Cents Coups (1959) for example (p.20), and the matters surrounding the casting of Truffaut film legend Jean-Pierre Leaud in the same film. It is the way Le Berre's book offers priviliged access to documents not normally open to public scrutiny which is perhaps its greatest selling-point. In essence, studying the book becomes like moving from a guided tour of stiffly-posed family photographs chosen at your hostess' whim to viewing rather more interesting candid shots when your hostess has temporarily departed to make un encore du cafe in a rather distant kitchen. It is the sense of intimacy and looking in on a distinctly private visual history of Truffaut's films which is as wonderful as the anecdotal history provided alongside the images. Thus, the many splendid candid shots of the crew in action (pages 100 and 111 for example) add a vibrant spontaneity to the story of the film-making process which would be hard to replicate with stills from the released films. The double-page spreads that contrast shooting script (with marked changes) and stills from the film (cf. page 103 and others) also provides a sumptuous feast for the eyes. The book closes with a detailed page of biographical notes and a filmography which provides a precis of each film together with technical details of cast and crew. It is an appropriately effective way to round off a book that, from the fascinating front cover shot of Truffaut avec camera to the iris-like title page for the section on each film and finally the end-papers (which show the film crew shooting the famous finale of Les Quatre Cents Coups , absorbs, delights and intrigues. 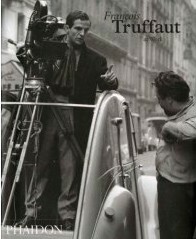 Francois Truffaut At Work is potentially a new phenomenon- yes, it is a coffee-table book, but it is much, much more than that. Like the French, this adjunct of the coffee-table world is sophisticated, refined and continually interesting, revealing its subject as a man dedicated to his craft. It is the way Francois Truffaut made cinema his vocation that comes across most strongly from Le Berre's book, a publication that itself was obviously a vocation for its author. Whether you have merely seen Truffaut's films, own them on DVD or are an aficianado par excellence, the opportunity to understand more about the man behind them and his way of working should be a totally unmissable one. 'Francois Truffaut At Work' is published by Phaidon Press.